Okay, the weekend is nearly here. If you haven’t bought your cream line milk yet, you still have time to take part in this week’s local food challenge. Here’s the link to part 1 where we challenge you to get out there and find yourself some locally produced cream line milk. Come on – I’m dying to hear about your experience with that rich, creamy, un-fooled-around-with nectar. Add a comment with your thoughts to this post and be eligible to win a copy of Shannon Hayes’ ever useful book, Grassfed Gourmet. How long will my milk last in my refrigerator? Because your milk is not pasteurized at a super high temperature like most store brands, it will not last for an eternity in your refrigerator. You need to use it up. 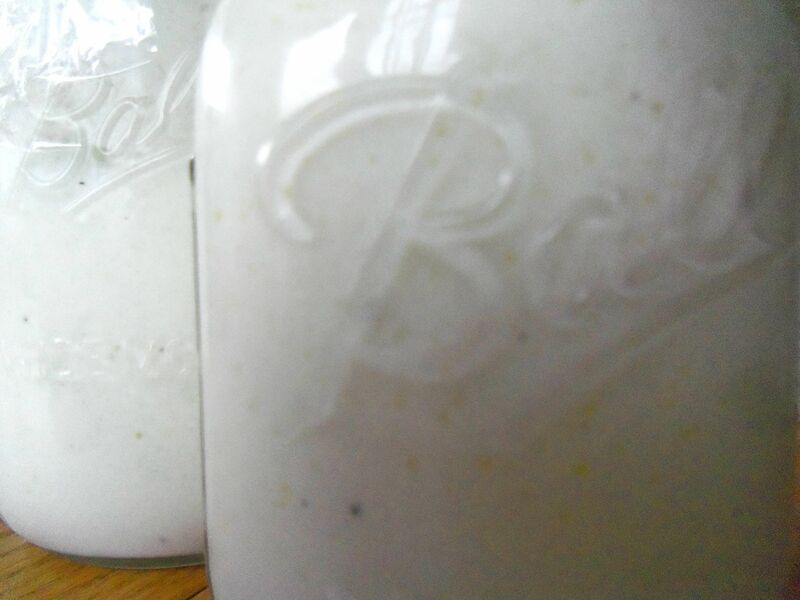 Learning to make simple cheese is a way to keep your farm-fresh milk living on long after the sell-by date has passed. 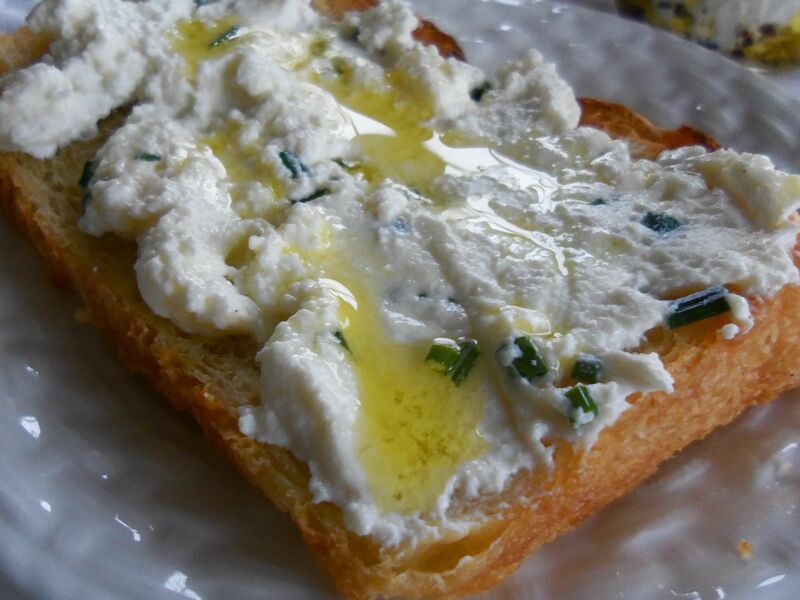 Be sure to consume any soft or fresh cheeses you’ve made by the sell-by date on the milk. 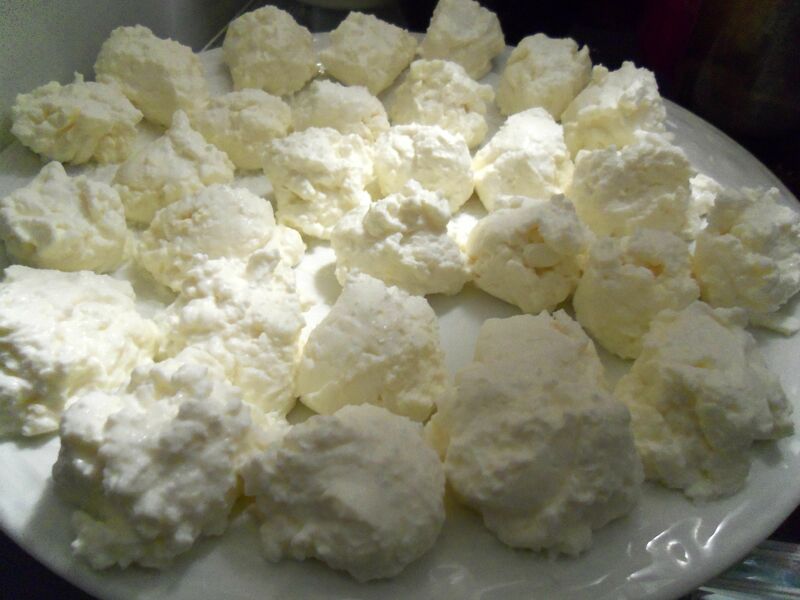 Making fresh cheese does not extend the life of your milk. Is there any way to extend the life of my fresh cheese? 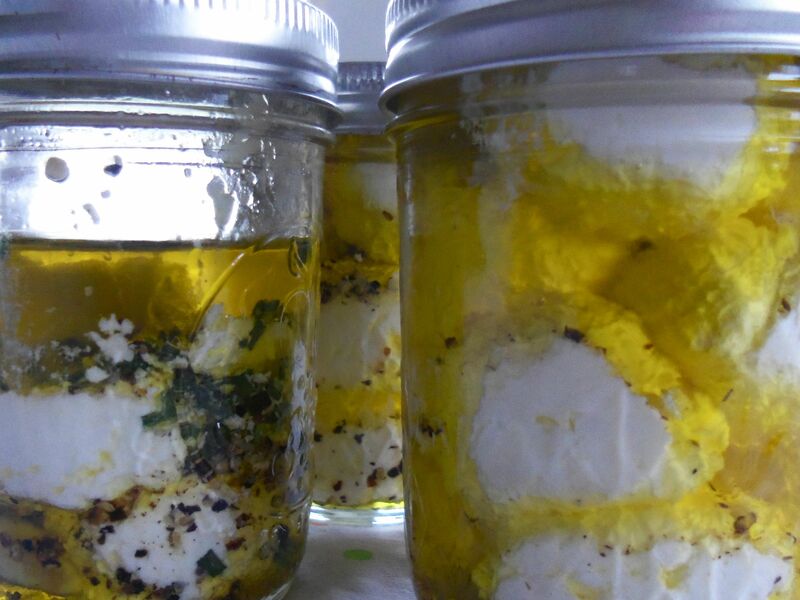 When my fresh cheese is nearing the end of it’s shelf life, I just shape it into teaspoon sized balls, air dry it in the fridge a bit to form a tender crust, store in a very clean jar and cover completely with olive oil. The oil creates an anaerobic environment that keeps the cheese from spoiling, and they’re just amazingly yummy. You can roll the balls in herbs, add cracked pepper, a garlic clove and a bit of crunchy salt if you like. I have never been able to keep this cheese around long enough to test exactly how long it stays safe, it’s just too good to hang around long. Is cream line milk raw milk? No, though it can be. While raw milk is always cream line, not all cream line milk is raw. Some of our dairies are pasteurizing their raw milk at lower temperatures for a longer period of time to preserve more of the live virtues of milk while killing off the pathogens. Cream line milk has not been subject to the additional process of homogenization which smashes the milk globules through a fine screen under heat and pressure to prevent the separation of the fat. To drink cream line milk, just give it a good shake before pouring and enjoy the creamy yumminess. I don’t want full fat milk – can I buy low-fat cream line milk? Many of you fat-phobes will feel a shudder of horror at the gorgeous layer of rich cream that will rise to the top of your milk. I too was once a worshipper of all things low-fat, and have now done a complete 180º turn in my thinking. But that’s a challenge for another day – you can read up on that one for yourself. Since cream line milk is virtually straight from the cow, it is not possible to buy it low-fat. It is however possible to reduce the fat in your home dairy efforts yourself simply by skimming the cream from your milk before using. Now I have a reasonable equivalent of 2% milk and a small jar of cream for coffee, whipping or making butter. I hope you’ve learned something useful and approachable here and will begin widening your dairy exploration. It is amazing just how much more delicious it is, and how easy. Anyone can do it without spending tons on new gadgets and ingredients. If you want to learn more, New England Cheesemaking Supply’s content-rich site is full of recipes, tutorials and all sorts of goodies and it’s my favorite price: free! And, don’t forget the reason this is all so important; becoming a supporting player in the fight to keep Pennsylvania dairies alive and well. We still have lots of excellent local dairies here – let’s keep it that way by buying from companies we know! A schmear of my marinated quark on home-made toast. I love the olive oil too, so drizzle extra on top. it’s the start of an epic veggie sandwich! remember to keep the cheese balls submerged under the olive oil and dip out of the jar with a clean spoon for longest shelf life…and store your jar in the refrigerator. Okay, I’m waiting to see what dairy delights you’re cooking up this weekend… don’t let us down!